I almost can't believe this happened, but we took the free IKEA bus to the world's largest IKEA store, south of Stockholm, Sweden. We were on this free bus (which leaves Stockholm weekdays, on the hour, returning from IKEA every 30 to 45 minutes) because I was so curious to discover if the world's largest IKEA store in Sweden was exactly like IKEA stores in North America. Logical accommodations for those who use wheels (shopping carts, wheelchairs, strollers, bicycles) are everywhere around Stockholm, including inside IKEA. Not only is this thoughtful, but imagine the money and energy saved (and the fun we all get to enjoy together) by bypassing escalators. Amazingly, electric bicycles were for sale. I assumed they were expensive, so I didn't calculate (convert) the price at that time. Turns out, these electric bicycles were selling for less than $200 each! Had I realized the actual price then, I would have made a purchase—or two. The most logical bedding on earth was also for sale. A fitted sheet over a single mattress, plus a "duvet cover" (buttoned sheet) enclosing the blanket (which can also act as a top sheet). This means no bulky mattresses to move, and no heavy blankets to wash—just sheets! Scandinavia and Europe have been handling bedding so wisely for years. It made my heart sing to see this available at IKEA. 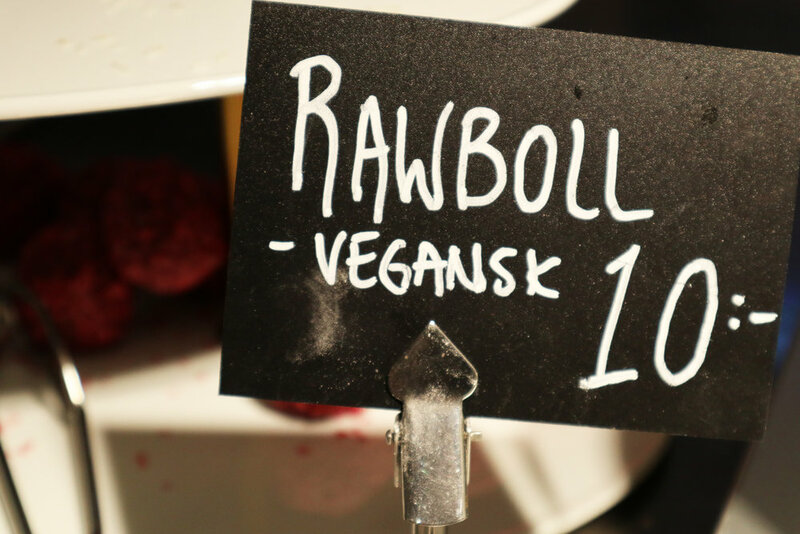 Raw vegan food at IKEA! And these goodies can be found at any one of the three restaurants (restaurang) located inside the largest IKEA on earth. The bus ride home is shared with many shoppers and their purchases, both of which can take up their own seat. So it’s wise to be one of the first in line for the bus, to ensure a seat. One should also be prepared to give up their seat to elderly and pregnant riders, out of thoughtful respect (there is standing room). The bus ride takes about 20 minutes and one can actually get off at different stops. When we saw a rider exit the bus at a stop located close to our lodging, we just followed that rider off the bus. However, I’m not sure if riders can request this or if the bus automatically does this. I felt a bit panicked when I realized that we neglected to actually stand in line for the bus (we stood politely off to the side; an old habit from island living). So the more people I saw getting on the bus, the more I worried about being squished into the bus (not that Swedes do this; it's just my fear). My instinct at that point was to rush to get in line. But that would have been a bit rude. So thank goodness I remembered to just breathe. We barely fit on the bus, but if we hadn't? We could have calmly waited (and been first in line) for a seat on the next free bus. It's so funny, though, how in those little moments of internal panic, at that time, I couldn't even think of that option!